Hurns (ankle) may be left without a role after the Cowboys signed slot receiver Randall Cobb to a one-year, $5 million contract, Kate Hairopoulos of The Dallas Morning News reports. Cowboys VP Stephen Jones recently indicated that Hurns (ankle) is expected to be ready for training camp and could be an option to replace Cole Beasley in the slot, Jon Machota of The Dallas Morning News reports. "When you look at Hurns and what he was in Jacksonville, he was a slot. He's certainly an option if we lose Beasley, in terms of filling that role," Jones said at the NFL Scouting Combine. Cowboys vice president Stephen Jones said he expects Hurns (ankle) to stay with the team for 2019, Jon Machota of The Dallas Morning News reports. Hurns underwent surgery Saturday night to repair his left ankle, ESPN's Todd Archer reports. Analysis: Per Adam Schefter of ESPN, the wideout, who dislocated his ankle in Saturday's playoff win over the Seahawks, is expected to be ready to return to football activities by August, in the absence of any unexpected complications or setbacks. 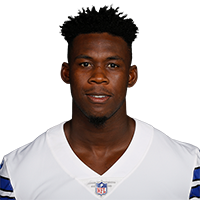 Hurns, who is under contract with the Cowboys in 2019, finished the 2018 season with 20 catches (on 35 targets) for 295 yards and two TDs in 16 games. Owner Jerry Jones said Hurns (ankle) is out for the rest of the playoffs, David Helman of the Cowboys' official site reports. Analysis: Hurns suffered the gruesome ankle fracture in the first quarter of Saturday's wild-card win against the Seahawks and was loaded onto a stretcher before being carted off the field. Jones also said that the 27-year-old went straight into surgery after leaving the stadium, Brandon George of The Dallas Morning News reports. Tavon Austin and Noah Brown could both see increased chances at wide receiver in his absence. Analysis: Hurns had his left foot pinned underneath a defender after making a catch in the first quarter, which resulted in his foot pointing in the wrong direction. The 27-year-old was loaded onto a stretcher and carted off the field with an apparent air cast on his left leg and most certainly will not return to Saturday's game. 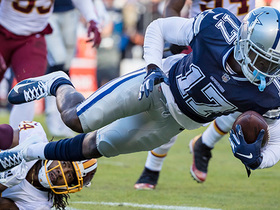 Analysis: Earlier in the season, Hurns was arguably the Cowboys' top receiver. Now, with Amari Cooper in the fold and the likes of Blake Jarwin developing, Hurns hasn't cracked double digits in receiving yards since Week 10. The Cowboys' pass offense has run hot and cold, and Cooper has dominated what success Dallas has had. Sunday does offer a solid opportunity for Hurns to get back on track as Dallas hosts a bottom-10 pass defense in Tampa Bay, who is surrendering 274 receiving yards per game. Hurns was targeted once during Sunday's 29-23 win over Philadelphia, converting it into a 9-yard catch. Hurns (thumb) practiced fully Tuesday, Jon Machota of The Dallas Morning News reports. Analysis: Hurns was limited by a thumb issue during Monday's practice, but he appears to be no worse for the wear as Thursday's big matchup with the Saints approaches. He played a four-week-high 32 offensive snaps last Thursday versus the Redskins, turning the increased reps into just one catch for seven yards. Considering he's gathered in more than two passes in a game only twice this season, Hurns clearly isn't a regular consideration of Dak Prescott. Hurns (thumb) took part in full during Tuesday's practice session, Jon Machota of The Dallas Morning News reports. Analysis: A thumb issue limited Hurns during Monday's practice, but he appears to be no worse for the wear as Thursday's big matchup with the Saints approaches. He played a four-week high 32 snaps last Thursday against the Redskins, turning it into just one catch for seven yards. Considering he's hauled in more than two passes in a game just twice this season, Hurns' fantasy utility is limited mainly to just deep leagues. Hurns was listed as a limited practice participant Monday due to a thumb injury. Hurns could rejoin the starting lineup Thursday if Michael Gallup (personal) isn't in the lineup. 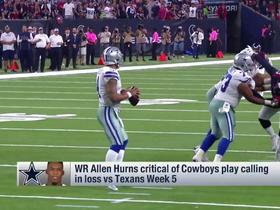 Analysis: Hurns' role in the Dallas offense has been dwindling since the acquisition of Amari Cooper, and he saw a season-low eight snaps and zero targets in Sunday's win over Atlanta. A death in Gallup's family could require the rookie to be away from the team for the Thanksgiving day game against Washington, however, opening the door for Hurns to start. He's only topped 40 yards in a game once this year, so even in an expanded role, he'd be a risky fantasy option. Hurns caught both of his targets for 40 total yards during Sunday's 27-20 win over Philadelphia. 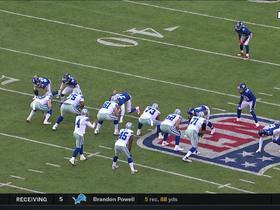 Analysis: Hurns helped set up a last-second touchdown just before halftime when he toe-tapped along the sideline for a 17-yard completion to bring Dallas to the 1-yard line. Hurns has suffered the most with the arrival of Amari Cooper, seeing just three targets in two games. He's made some clutch catches with those targets but seems to be the odd man out in Dallas, making him a tough fantasy play -- even Sunday against Atlanta's bottom-five pass defense. Hurns was targeted once during Monday's 28-14 loss to Tennessee, recording a 23-yard touchdown catch. Hurns could see his snap count fall following the acquisition of Amari Cooper. 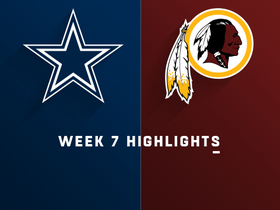 Hurns caught five of six targets for 74 yards during Sunday's 20-17 loss to the Redskins. Analysis: Hurns finished second on the team in targets, catches and yardage in what was a nice bounce-back performance after he was shut out last week. He came into the game with just 84 receiving yards through his first six outings, so this comfortable season high indicates that he could be working his way into the offensive gameplan. Hurns will enjoy a bye next week before taking on the Titans in Week 9. Hurns did not convert any of his five targets during Sunday's 40-7 win over the Jaguars. Analysis: Just days following his criticism of a Week 5 play call, Hurns found himself without a catch. The first-year Cowboy has nabbed just 36 percent of his targets this season while fellow target Cole Beasley asserts himself as the option to own in Dallas' receiving corps. 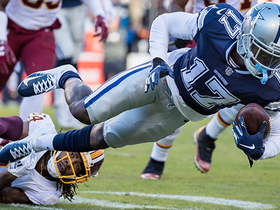 There is little reason to expect Hurns to blow up Sunday as the Cowboys take on a Washington defense ranked ninth in opponent passing yards per game. Hurns was targeted three times during Sunday's 19-16 loss to Houston and came away with a three-yard touchdown. Hurns caught three of five targets for 30 yards in Sunday's win over the Lions. 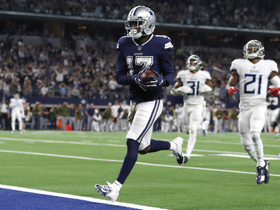 Analysis: While he did tie for the team lead in targets with three other receivers, Hurns has yet to make much of an impact for the Cowboys -- the 30 yards were a season high for the fifth-year wideout. With only 14 targets through four games, the volume just isn't there for Hurns to be useful in most fantasy formats. Hurns caught two of four targets for 22 yards in Sunday's loss to the Seahawks. Analysis: He was once again minimally involved in the Cowboys' somnambulant passing game, although Hurns' four targets actually tied with Michael Gallup for the team lead among wide receivers. Until Dak Prescott starts -- or is allowed to start -- looking downfield on a consistent basis as opposed to dinking and dunking, it will be hard for any Dallas wideout to put up consistently useful fantasy numbers. Hurns caught one of two targets for nine yards during Sunday's 20-13 win over the Giants. Analysis: Hurns signed with Dallas before the release of Dez Bryant and, among the variety of new acquisitions, was thought to be the likeliest to try to fill the No. 1 role. That hasn't played out yet. September pickup Deonte Thompson has been more productive, and Cole Beasley has led the team across most statistical categories. Hold off until Hurns until he shows chemistry with Dak Prescott that hasn't been exhibited yet. Hurns caught one of three targets for 20 yards in Sunday's loss to the Panthers. 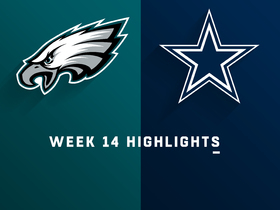 Analysis: The entire Cowboys passing game struggled thanks to inconsistent play by both Dak Prescott and the offensive line, resulting in a quiet first game for Hurns in a Dallas uniform. He still saw more targets than either Terrance Williams or rookie Michael Gallup, however, and Hurns' chemistry with Prescott can only grow from here. Hurns finished the preseason with three catches for 26 yards. Analysis: The assumption since the Cowboys parted ways with Dez Bryant in April was that Hurns might be the No. 1 receiver in Dallas by default to begin the season. Rookie Michael Gallup pulled in seven catches for 75 yards and a touchdown during the preseason, and it's likely that he'll work in tandem with Hurns as the Cowboys' outside receivers while Cole Beasley serves as the primary slot option in Week 1. Hurns (groin) got the start at wide receiver during Thursday's preseason opener against the 49ers and finished with one catch for 13 yards. Hurns is part of a receiving corps that no longer includes Dez Bryant, who the Cowboys released Friday, Todd Archer of ESPN.com reports. Hurns is signing a two-year contract with the Cowboys, Adam Schefter of ESPN reports. Hurns will visit the Cowboys on Wednesday, Josina Anderson of ESPN reports. Analysis: Hurns was originally slated to visit the Jets, but with a snowstorm on its way to New York on Wednesday he opted to redirect to Dallas. The 26-year-old would join Dez Bryant, Terrance Williams and Cole Beasley in the team's receiving corps if he signs with the Cowboys. Hurns will visit the Jets on Wednesday, Adam Schefter of ESPN reports. Analysis: Hurns was released by the Jaguars earlier Tuesday and won't waste any time in his search for a new team. The 26-year-old hauled in 39 of 56 passes for 484 yards (8.6 YPT) and two scores in 10 games last season. If he signs with the Jets, Hurns would compete with Robby Anderson, Jermaine Kearse and Quincy Enunwa (neck) for targets. The Jaguars are releasing Hurns, who figures to have a strong market as a free agent, Adam Schefter of ESPN reports. Hurns could be released this offseason, James Koh of NFL Newtork reports. Hurns snagged six of seven passes for 80 yards during Sunday's 24-20 AFC championship game loss to New England. Hurns brought in one of two targets for 12 yards in Sunday's 45-42 AFC divisional-round win over the Steelers. Hurns failed to bring in the only target he saw in Sunday's 10-3 AFC wild-card win over the Bills. Hurns (ankle) brought in three of five targets for 38 yards in Sunday's 15-10 loss to the Titans. Hurns (ankle) does not carry an injury designation for Sunday's game against the Titans. Hurns (ankle) was a limited participant at Wednesday's practice. Hurns (ankle) is inactive for Sunday's game against the 49ers. Analysis: As is Marqise Lee (ankle), leaving the Jaguars' Week 16 wideout duties in the hands of Keelan Cole, Dede Westbrook and Jaydon Mickens, with Jaelen Strong available as a depth option. Hurns (ankle) isn't expected to play Sunday against the 49ers, Ian Rapoport of NFL Network reports. Analysis: With Marqise Lee (ankle) already ruled out Sunday, it looks like the Jaguars' Week 16 wideout corps will be led by Keelan Cole, Dede Westbrook and Jaydon Mickens. Meanwhile, Jaelen Strong, who was promoted to the team's active roster earlier this week, is on hand as a depth option. Hurns (ankle) is listed as questionable for Sunday's game against the 49ers, Ryan O'Halloran of The Florida Times-Union reports. Hurns (ankle) was a limited participant at practice Thursday. Hurns (ankle) was limited at practice Wednesday. Hurns (ankle) is expected to take part in Wednesday's practice, Mike Kaye of FirstCoastNews.com reports. Hurns (ankle) has been ruled out for Sunday's game against the Texans. Analysis: Though initially listed as a limited participant Thursday on the Jaguars' posted injury report, Friday's version now lists Hurns as a non-participant all week. In any case, Hurns is now set to miss his fifth straight game, leaving Marqise Lee, Dede Westbrook and Keelan Cole to head the team's Week 15 wideout corps. Hurns (ankle) didn't suit up for Friday's practice, Mike Kaye of FirstCoastNews.com reports. Analysis: Hurns practiced Thursday for the first time since Week 10, but he's either being rested Friday or dealing with some soreness, as he was not spotted on the practice field. The wideout's participation Thursday gives him a slight chance to play Sunday against the Texans, but it's more likely the Jaguars will hold him out for another week. Hurns (ankle) was listed as a limited practice participant Thursday. Analysis: Hurns hasn't played since Nov. 12, but his return to practice Thursday, albeit in a limited capacity, signals that he has a shot to return to action as soon as Sunday's game against the Texans. If he is able to return to action this weekend, it's unclear how involved Hurns would be in the Jaguars passing game out of the gate, with fellow wideouts Marqise Lee, Dede Westbrook and Keelan Cole also in the mix. Hurns (ankle) did not practice Wednesday. Analysis: Per the Florida Times-Union, Hurns -- who has missed the Jaguars' last four games -- was spotted jogging on a side field during the media viewing period of Wednesday's practice. While that's a sign of progress, the wideout's status for Sunday's game against the Texans remains decidedly cloudy. Hurns (ankle) is not expected to practice Wednesday. Analysis: Hurns continues to recover from an ankle injury suffered in mid-November, and it does not appear Wednesday will be the day he gets back on the practice field. He will have a couple more opportunities to get some work in prior to Sunday's matchup with the Titans, but given the length of his absence, he is going to need to get in some sort of practice before returning to game action. Hurns (ankle) has been ruled out for Sunday's game against the Seahawks, Mike Kaye of FirstCoastNews.com reports. Analysis: Hurns hasn't practiced since suffering a sprained right ankle in Week 10 against the Chargers and will be sidelined for the fourth game in a row. The Jaguars have been splitting Hurns' snaps primarily between Keelan Cole and Dede Westbrook in the previous three contests, and the same course of action will likely be in play Sunday. Hurns (ankle) isn't expected to practice Thursday, John Oehser of the Jaguars' official site reports. Analysis: Hurns hasn't practiced in any capacity since suffering a right high-ankle sprain Nov. 12 against the Chargers, likely putting him in line to miss his fourth consecutive game. Assuming Hurns remains out for Sunday's showdown with the Seahawks, Marqise Lee, Dede Westbrook and Keelan Cole would see the majority of the snaps at wide receiver. Hurns (ankle) will be held out of practice Wednesday, Michael DiRocco of ESPN.com reports. Analysis: While Hurns will have two more practices this week to show that he's made progress in his recovery from the right high-ankle sprain, his absence Wednesday doesn't offer much encouragement about his ability to play Sunday against the Seahawks. Hurns has missed the Jaguars' past three games with the injury, resulting in Dede Westbrook and Keelan Cole taking on elevated roles in the team's passing attack. Hurns (ankle) won't play Sunday against the Colts, Ryan O'Halloran of The Florida Times-Union reports. Analysis: Hurns hasn't practiced since spraining his right ankle late in the Jaguars' Week 10 win over the Chargers, thus making his status for future contests after Sunday somewhat murky. His outlook on that front could change if he's able to return to the field next week, but in the meantime, the Jaguars' wideout corps will continue to be headed by Marqise Lee, Dede Westbrook and Keelan Cole in Week 13. The Jaguars aren't expecting Hurns (ankle) to take part in practice Thursday, Michael DiRocco of ESPN.com reports. Analysis: With Hurns seemingly in line to go down as a non-participant for the second day in a row to begin the week of practice, it's looking unlikely that he'll be able to return from a two-game absence to play Sunday against the Colts. Hurns' ongoing absence has allowed Keelan Cole and Dede Westbrook to pick up a fair share of offensive snaps alongside No. 1 wideout Marqise Lee. Hurns (ankle) isn't expected to practice Wednesday, Michael DiRocco of ESPN.com reports. Analysis: Hurns' right-ankle sprain has sidelined him for the Jaguars' past two games and his lack of involvement in the team's first practice session of the new week suggests he hasn't made much notable progress in his recovery from the injury. Barring a dramatic turnaround before the end of the week, Hurns looks bound to miss another contest, which would pave the way for Dede Westbrook and Keelan Cole to see increased snaps and targets on offense behind No. 1 wideout Marqise Lee. Hurns (ankle) has been ruled out for Sunday's game against the Cardinals. Analysis: Hurns' ongoing absence sets the stage for Keelan Cole and Dede Westbrook to continue to see added involvement in the Jaguars' passing offense in Week 12 while working behind top wideout Marqise Lee. Hurns (ankle) didn't practice Wednesday. Analysis: While he hasn't been ruled out for Sunday's game against the Cardinals, Ryan O'Halloran of The Florida Times-Union relays that Hurns was sporting a protective boot as of Tuesday, which doesn't bode well for the wideout's Week 12 status. Another Hurns absence would pave the way for Keelan Cole and Dede Westbrook to see added involvement in the passing attack behind top wideout Marqise Lee (knee). Hurns (ankle) remains in a walking boot, but no longer requires the assistance of crutches to move around, Ryan O'Halloran of The Florida Times-Union reports. Analysis: While it amounts to a positive step forward for Hurns, the wideout is seemingly trending toward a second straight absence due to the right high-ankle sprain. According to John Reid of The Florida Times-Union, Hurns was held out of practice Tuesday, and it's unclear if he'll be able to get on the field in any capacity prior to Sunday's game against the Cardinals. Hurns (ankle) will sit out practice Tuesday, John Reid of The Florida Times-Union reports. Analysis: Hurns missed his first game of the season in the Week 11 win over the Browns while battling the right high-ankle sprain, with Keelan Cole (three catches for 24 yards on six targets) and the newly activated Dede Westbrook (three catches for 35 yards on six targets) primarily filling his volume in the passing game. While Hurns isn't starting Week 12 preparations on a good note, he'll still have a few more opportunities to prove he's healthy in advance of Sunday's game against the Cardinals. Hurns (ankle) has been ruled out for Sunday's game against the Browns, Hays Carlyon of 1010 AM WJXL reports. Analysis: With Hurns out this week, look for Keelan Cole and Dede Westbrook (assuming he's activated from IR) to see added opportunities in the Jaguars offense Sunday, while Marqise Lee maintains his status as the team's top wideout. Following a week in which he did not practice at all, Hurns' Week 12 status is cloudy at this time. Hurns (ankle) did not practice Thursday. Analysis: Back-to-back missed practices foreshadow Hurns' expected absence for Sunday's game against the Browns. Assuming he's ruled out, fellow wideouts Keelan Cole and Dede Westbrook (a candidate to be activated from IR) would be in line to help fill in for Hurns this weekend. Analysis: Hurns still required the assistance of a walking boot and crutches while he was on the sideline during Wednesday's practice, so it's not surprising that he won't be ready to return to the field a day later. Unless the wideout displays dramatic progress in his recovery from the right ankle sprain before the Jaguars' final practice of the week Friday, don't count on him suiting up Week 11 against the Browns. Hurns (ankle) was still using a walking boot and crutches Wednesday, but he said an MRI didn't reveal any structural damage to his injured leg, Ryan O'Halloran of The Florida Times-Union reports. Hurns (ankle) isn't scheduled to participate in practice Wednesday, Mike Kaye of FirstCoastNews.com reports. Hurns (ankle) is expected to miss Sunday's game against the Browns, Michael DiRocco of ESPN.com reports. Following Sunday's 20-17 overtime win over the Chargers, Hurns left the Jaguars' locker room sporting a walking boot on his right foot, with the assistance of crutches, Ryan O'Halloran of The Florida Times-Union reports. Analysis: Hurns, who hauled in seven of his nine targets for 70 yards in the game, was carried to the locker room late in the fourth quarter of the contest after suffering a right leg injury, subsequently crawling off to the sideline so the Jaguars could replace him. At first glance, this has the look of an injury that could cost Hurns some action, so his status will need to be monitored in advance of next weekend's game against the Browns. Hurns turned nine targets into seven catches for 70 yards in Sunday's 20-17 overtime win over the Chargers. Analysis: Hurns led his team in receiving yards, but fellow wide receiver Marqise Lee got into the end zone for the second consecutive week while Hurns still hasn't found pay dirt since Week 3. Quarterback Blake Bortles only managed 273 yards and that one touchdown on a season-high 51 passing attempts, so expectations for Jacksonville's passing game on the whole should remain low. Hurns caught three of four targets for 31 yards in Sunday's 23-7 win over Cincinnati. 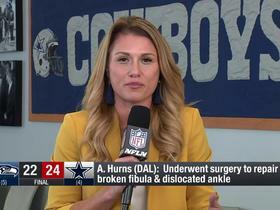 NFL Network's Jane Slater reports the latest on Dallas Cowboys wide receiver Allen Hurns after his injury against the Seattle Seahawks in their NFC Wild Card matchup. 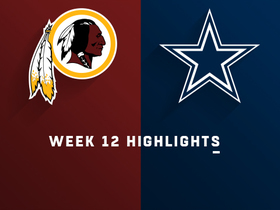 The Washington Redskins faced off against the Dallas Cowboys in Week 12 of the 2018 NFL season. 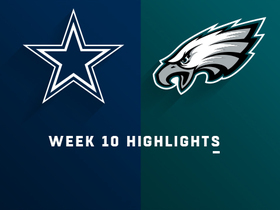 Dallas Cowboys quarterback Dak Prescott lofts a 23-yard touchdown pass to wide receiver Allen Hurns in the second quarter of a Week 9 matchup against the Tennessee Titans on "Monday Night Football." Dallas Cowboys wide receiver Allen Hurns sets himself up for a 33-yard gain. Dallas Cowboys wide receiver Allen Hurns catches a perfect pass from quarterback Dak Prescott for 20 yards and a first down. Dallas Cowboys wide receiver Allen Hurns lets his critical thoughts known of the playing calling in Dallas.